Excited about this girl! Great color and horn over more horn in the pedigree. The minute I saw her I had to have her. Love that black and white paint coloring. Black traces back to BL Night Chex thru Kelo Chex. all on dam side. also a line coming from Shadow. Many very large cows in her pedigree. There are some spots in that white coat. 2 females over 90" TTT plus 9 more over 80" TTT animals in there. 12 over 80" ttt animals in there. Poco Lady, Rio Catchit, Working Woman. Tari Graves, Ringa Dinger added to Mile Marker, Gunman, Starlight. This could be very interesting. Dam will be a mid 80" TTT cow. Line bred Helm Laura’s Light Mocha. Mr. Right over a full sister to Tuff Justice. Drag Iron over Cowboy Tuff Chex. Linebred Jamakizm on the top. Several industry iconic females in here: Wiregrass Laura, Helm Laura's Light Mocha and BL Rio Catchit. This combines two 90' + TTT females in the two closest females slots up front in the pedigree, Helm Laura's Light Mocha and Hicks Miss Strawberry. Increases the percentage of 90" genetics of the pedigree. Very excited to have a Mr. Right heifer. This line breeds Helm Laura's Light Mocha. Matches Drag Iron and Tejas Star as Grand Sires. Off to a great start. Look at those horn buds! They don't make them any prettier than this. Influences from TTT Lucky, Cowboy Casanova, Overhead and Jamakizm. Black comes from Overhead on sire side. 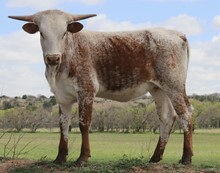 Futurity winner at the 2019 Texoma Sale. Daughter of Delta Lucky Ace. Dam is Super Zing, who is the dam of Betty Zane. She is a horn producer. Flashy color and off to a great start with horn length and direction. 10 over 80" in her pedigree. Not common to see Tempter with anything Cowboy Chex, Tuff or Catchit. Could be crazy good. Some large females in this pedigree. Fifty Shades Darker is new on the scene. Lots of horn here from Fifty Fifty added to Vanilla Milkshake. Tracing back the black it is on the maternal side and possibly goes back to Jet Jockey. Well built heifer. Dam is over 95" TTT, sire is 92" TTT. Dam is being sold at 2019 Legacy for the second time in her life. She should be upper 90's by the time she sells in March. 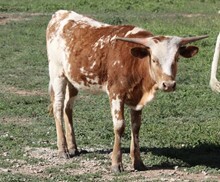 Add the firepower of Houdini and you have a nice recipe for horn growth, and size plus conformation from the dam. 92" Houdini and Helm Laura's Light Mocha, 95". So much to like here.....Cowboy Catchit Chex over Hunts Respected Jenny and Gunman....plus Linebred BL Coach Safari, JP Rio, Farlap Chex and VJ Tommie. Has to work right????? Top Caliber over Phenomenon has worked repeatedly and in big ways. Colorful example from Houdini. Awesome Me is a huge cow so this girl should have some size to go with those horns! Grand dam of BL Monika. Goes back to JP Rio 3x and Poco Lady 2x. Black traces back from a full brother to Jet Black Chex on the dam side. Further back several generations there is Black Man/Impressive Man. Black traces back to dam side. Full brother of Jet Black Chex. Some Loomis breeding mixed in as well. Will cross her with a strong horned bull. Been hoping for a heifer from Becca Bella. The idea is that Tempting Fate will add a little base to her hornset....the rest is spectacular. Cowboy Tuff over Jamakizm over Mile Marker and Winchester. Horn growth over size and conformation. My second 20 Gauge daughter. Great horn set, height, disposition. bright future ahead for her. One of three full sisters. Sire is line bred HCR. Bottom is Jamakzim and BL Night Chex. Lots of Total Horn in this pedigree. Haystack, Hay Hook, Drag iron and Starlight. Real potential to throw black and white with big horn. Black is on dam side BL Night Chex. Excited to have a Saddlehorn daughter. 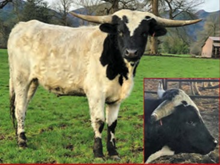 Extreme horn set back and black and white on both sides of the pedigree. She could end up being Homozygous black. Time will tell.